NYC DOT Commissioner Polly Trottenberg and NYPD’s Patrol Borough Brooklyn North Deputy Inspector Amin Kosseim today unveiled the Brooklyn Pedestrian Safety Action Plan that establishes a comprehensive set of actions for DOT, NYPD, and other agencies and serves as the next major step in achieving Vision Zero. The Borough Plans are one of 63 Vision Zero initiatives announced last year. The plans were developed by integrating detailed crash analysis with input from 28 Vision Zero town halls and public workshops, including over 10,000 comments submitted by New Yorkers. 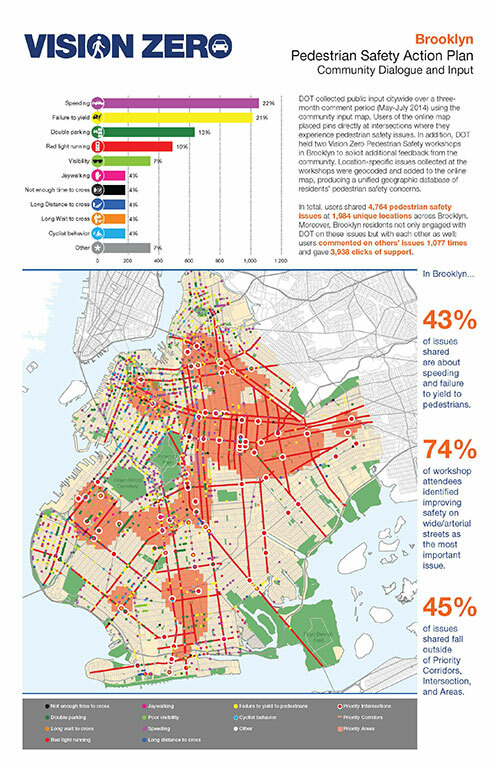 This analysis and input resulted in the identification of Brooklyn’s most dangerous corridors, intersections, and areas, which are clearly identified in the plan’s Brooklyn Priority Map. The announcement was held at Brooklyn Ascend Charter School in Brownsville, where DOT will install a midblock pedestrian safety median, traffic signal, and a new crosswalk on Rockaway Parkway this year to help parents and their children get safely to their school. Rockaway Parkway is identified as a “Priority Corridor,” meaning that it historically had high rates of death and severe injury to pedestrians. Priority corridors, intersections, and areas will be the focus of future engineering & planning, education, and enforcement activity. An average of 46 pedestrians were killed in Brooklyn each year in the three year period from 2011 to 2013, the most of any borough in the city. Pedestrians make up 56% of the traffic fatalities in Brooklyn. “The Borough Pedestrian Safety Plans is a hands-on approach to tackling our city’s dangerous corridors and intersections. Through community engagement, we are now equipped with the necessary data to make improvements in areas that will make the greatest impact and increase pedestrian safety,” Council Member Laurie A. Cumbo. In Brooklyn, pedestrian fatalities fell by 49% in the past three decades, but still one pedestrian is killed or severely injured in Brooklyn everyday. 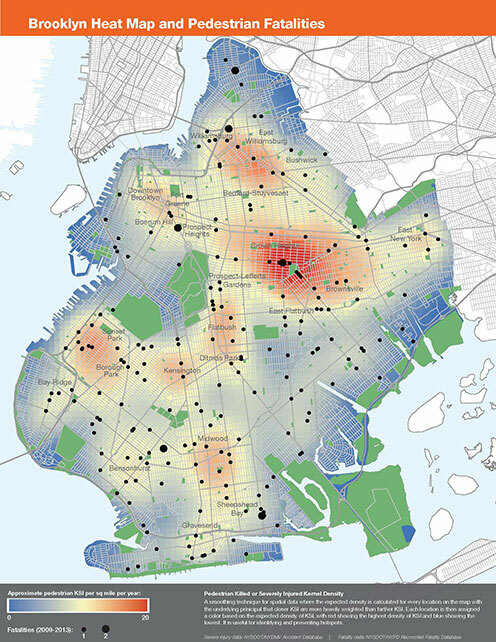 The highest crash locations in the borough are concentrated in neighborhoods such as Sunset Park, Crown Heights, Brownsville, South Williamsburg, and Bushwick and arterial streets like Atlantic Avenue and Ocean Parkway. Additionally, 36% of Brooklyn’s pedestrian fatalities occur on local residential streets, and 23% occur at the intersection of two such streets, compared to 16% citywide. Senior citizens comprise just 12% of the borough’s population, but account for 36% of the borough’s pedestrian fatalities. In Brooklyn, 40% of pedestrian travel occurs during rush hours, but only 20% of traffic fatalities occurred in that time, while 18% of pedestrian fatalities occurred in overnight hours (12 a.m. to 6 a.m.), though less than 5% of the pedestrian activity takes place in those hours. Dangerous driver choices were the primary cause or contributing factor in 65% of pedestrian fatalities. Overall the plan identified 49 Priority Corridors, 91 Priority Intersections, and 18 square miles of Priority Areas where crashes that severely injure or kill pedestrians are concentrated. Sixty one percent of all pedestrian fatalities from 2009-2013 were concentrated within these priority geographies. The 49 Priority Corridors consist of just 9 percent (142 miles) of the borough’s total street mileage but contain half of the boroughs total pedestrian fatalities and severe injuries (KSI.) The 91 Priority Intersections are just 1% of the over 10,000 intersections in the borough, but they were the site of 15% of its pedestrian KSI. Finally, the Priority Areas constitute just 25% of the borough’s land area (18 square miles) but contain half of all pedestrian KSI. 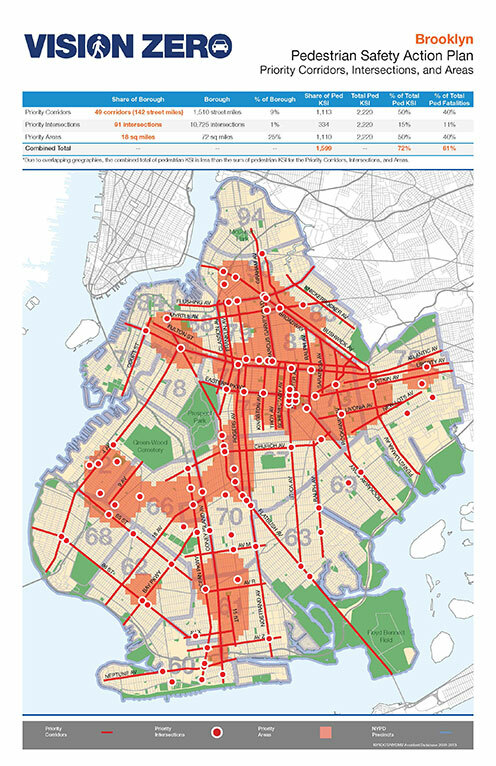 The plans for the first time reveal the detailed fatality and injury rates of individual corridors and intersections, which will improve how DOT and NYPD work with the public to improve safety. The Brooklyn Pedestrian Safety Action Plan also followed an extensive community outreach, dialogue and input process in 2014 at town hall meetings and public workshops and online, which resulted in over 4,764 pedestrian safety issues being shared with DOT. Speeding (22%) and failure to yield (21%) were the most frequently cited issues. Seventy four percent of workshop attendees viewed wide arterial streets as the most important areas for pedestrian safety improvements. And finally, 45% of the issues shared fall outside of the Priority Corridors, Intersections, and Areas, highlighting the need for improved engagement in areas with low levels of feedback but high rates of injury. This input will inform and guide our efforts to collaboratively develop interventions that will make Brooklyn safer. The Brooklyn Pedestrian Safety Action Plan and the other borough plans are available at the DOT website at www.nyc.gov/dot.